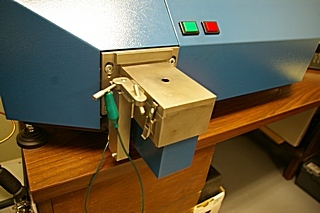 Chemical analysis using Optical Emission Spectroscopy (OES) necessitates a sufficient voltage to induce an arc between a tungsten electrode and the sample to be analyzed. As a result of the burn induced on the sample, light is emitted from the sample. Each element in the sample produces a characteristic wavelength which is measured by the spectrometer. The intensity of each wavelength is directly proportional to the concentration present. The intensities are calibrated by curves that are generated by NIST traceable or Certified Reference Materials (CRM) standards. Results are displayed in weight percent for each element chosen to be analyzed.